As shown in the video clip below, Edward Salim Michael reads his lectures, as he said, “The handicap of my lack of education and absence of a mother tongue obliges me to be extremely scrupulous so as not to mislead my listeners. Moreover, what I speak of in my lectures is so important that I cannot allow myself to talk about it without measuring each of my words. So, every sentence of my text has been thoroughly thought through and thoroughly weighed up. The text of the lectures, with question and answer sessions, has been published in the author’s final work: From the Depths of the Mists. 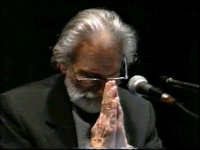 In this lecture, Edward Salim Michael explains that meditation should in fact be a form of initiation to death; he stressed the vital need for any aspirant to achieve recognition, in his lifetime, by direct experience, of the Source from which he has emerged and to which he will be reabsorbed when he leaves this form of existence. Because of his attachment to the world of sense, which has become a habit deeply ingrained in him, the human being develops irrational fear about death. If he fails to get rid of his customary individuality, so as to discover, through an intense practice of meditation, the Divine Aspect of his dual nature, he will not know how to face this vertiginous hour which awaits him. Faced with the difficulties they encounter to concentrate, seekers are often discouraged and tempted to abandon their practice. In this lecture, Edward Salim Michael explains the reason for these difficulties and provides means to go beyond them. He stresses especially the importance for the meditator to succeed in gathering together the differents aspects of his being – which, usually, are disunited – so as to find the strength to maintain a sustained effort of concentration by which alone it will be possible for him to arrive to detach himself from what he usually is, allowing thus the Higher Aspect of his dual nature to reveal itself to his inner vision. In this presentation, Edward Salim Michael considers the issue of sexuality from the perspective of an aspirant already embarked on a spiritual path. If he wants to succeed in disengaging himself from the dramatic pressure that this force exerts on him, he must come to understand how he is unwittingly used by Great Nature for the sole purpose of perpetuating the species. Moreover, it is necessary for him to understand the mechanisms at work both in himself and outside himself, through which he can be induced to commit errors which prove to be fatal for his progress toward the Supreme goal he hopes to reach.